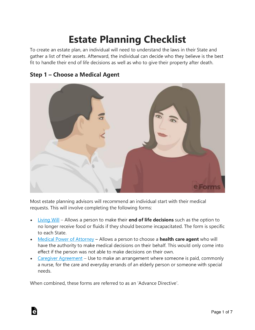 An estate planning checklist is a guide on how to plan an individual’s end of life care and their assets if they should become incapacitated or die. By following the checklist, an individual can get an idea of the estate laws in their State and choose which forms suit their personal financial situation best. This will allow a person to decide who they would like to handle their personal finances if they should not be able to themselves. In addition, someone can establish who will get what after they die and whether it’s best for the estate to go through the probate process. To create an estate plan, an individual will need to understand the laws in their State and gather a list of their assets. 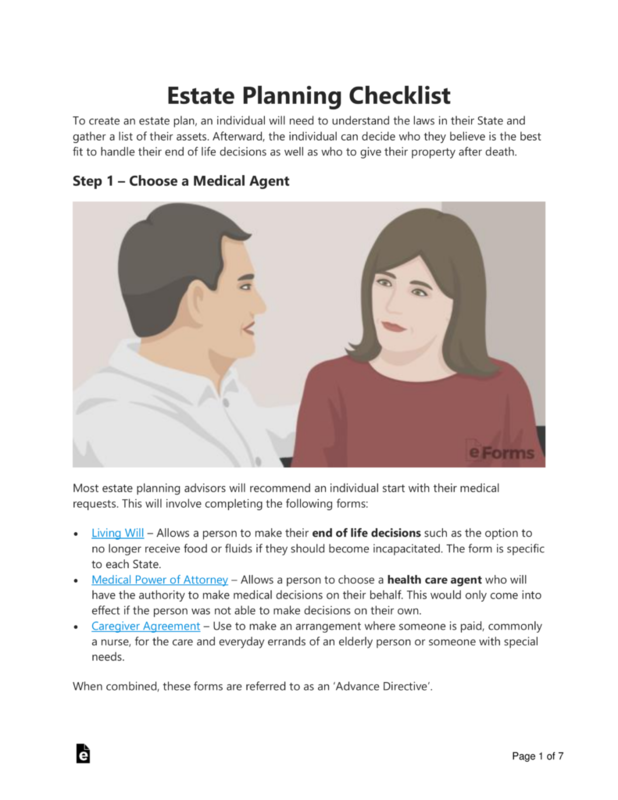 Afterward, the individual can decide who they believe is the best fit to handle their end of life decisions as well as who to give their property after death. Living Will – Allows a person to make their end of life decisions such as the option to no longer receive food or fluids if they should become incapacitated. The form is specific to each State. Medical Power of Attorney – Allows a person to choose a health care agent who will have the authority to make medical decisions on their behalf. This would only come into effect if the person was not able to make decisions on their own. 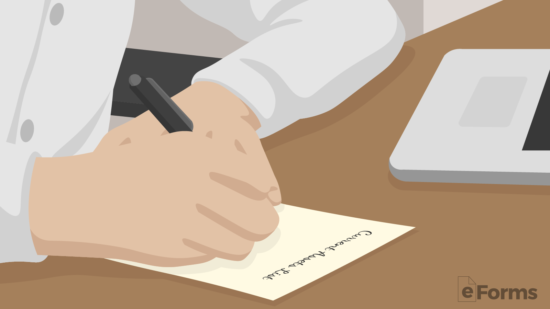 Caregiver Agreement – Use to make an arrangement where someone is paid, commonly a nurse, for the care and everyday errands of an elderly person or someone with special needs. 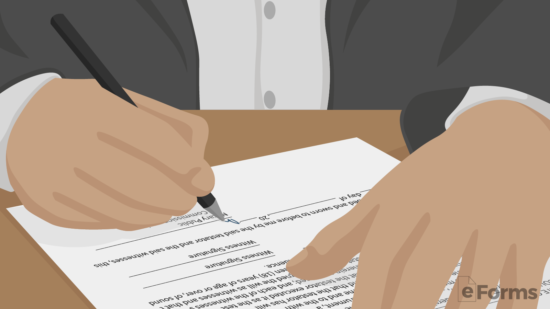 When combined, these forms are referred to as an ‘Advance Directive’. Durable Power of Attorney allows an individual to select a financial agent to handle their financial responsibilities on their behalf (referred to as an ‘attorney-in-fact’). There is no requirement for this person to be an attorney. Although, it’s highly advised the financial agent be someone that can be trusted. It is recommended that the same person be the financial agent and the health care agent. In order to begin managing the assets of the individual, a list of assets will need to be made to have an idea of its value. All items, including, but not limited to, real estate, investments, business entities, vehicles, assets, and any other property should be included with an estimated value. This list should also include any life insurance policies the person may have. Current Assets List – For personal use to better organize and list all personal property and real estate. The beneficiaries are the individuals that will be given the estate assets after the person dies. This is most commonly the spouse (if married) and the children (if any). The person can choose to give their assets to whomever they choose and is not only limited to individuals but also companies or organizations, such as non-profit institution. 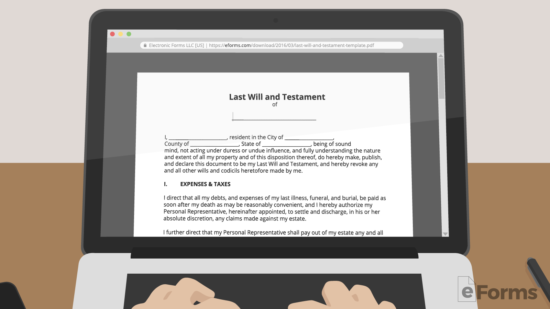 Last Will and Testament – Referred to simply as a ‘Will’, states who will get what after a person’s death. After death, the estate will go through the probate process that can take anywhere from 6 to 12 months. Living Trust – Avoids the probate process and allows the creator of the living trust to be the trustee and to remain collecting money being generated from the living trust’s assets. Recommended because the beneficiaries get to avoid the probate process and the document is more difficult to question by other family members. It’s not so easy to sign these forms. They must be done in accordance with their State’s execution laws which usually involve two (2) witnesses and a notary public. 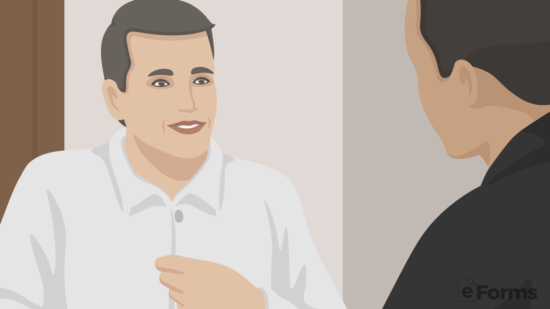 It is important that the witnesses are not mentioned in the estate documents, meaning that they cannot be the financial agent or a beneficiary. 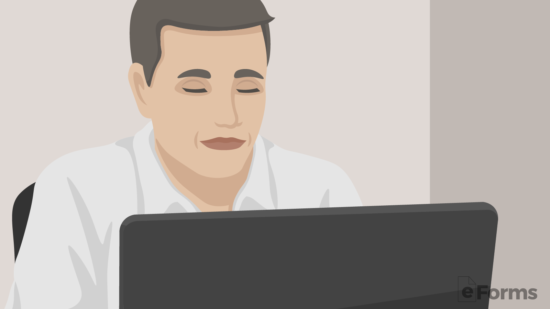 Notarize.com – Charges $25 and the process is completed online. Financial Institution – Such as Bank of America, TD Bank, and Chase Bank will notarize documents for free if the individual has an account. (Wells Fargo does not notarize documents). UPS Store – Every UPS Store has a Notary Public on staff. National Association of Notaries – Use this database to find a notary near you. After the documents are complete it’s important to have in a safe and secure place that family members are aware of for reference. The ideal location is with the individual’s attorney along with providing copies to trusted family members and friends.